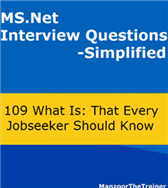 This eBook contains 109 important interview questions along with answers that any web developer looking for a job on MS.Net platform needs to know. It starts with two articles one of which talks about why most of the engineers are jobless and the other say the solution for it. Second edition is also on the way with focus on at least one real time example on each question.